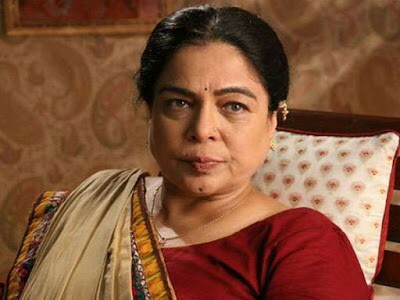 Reema Lagoo, veteran actor of film and TV, known for playing moms to big stars like Salman Khan and Shah Rukh Khan, has died at 59 of a cardiac arrest. Lagoo was admitted to the hospital late last night after she complained of chest pain, the hospital’s Executive Director Ram Naraian. Reema Lagoo was born Nayan Khadbade in 1958. 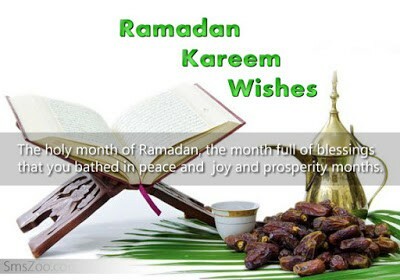 She was the daughter of a well-known Marathi actress and began acting herself after finishing school in Pune. She took the name Reema Lagoo after her marriage – she and her husband later separated but Ms Lagoo retained the name. Reema Lagoo’s best-known roles were as mother to the stars – she played Salman’s mother in Maine Pyar Kiya, Saajan and Hum Saath Saath Hain, Akshay’s mother in Jai Kishen, Kajol’s in Kuch Kuch Hota Hai, Shah Rukh Khan’s in Kal Ho Na Ho, and Madhuri Dixit’s in Hum Aapke Hain Koun. She played Sanjay Dutt’s mother in Vaastav, in which her character kills her gangster son. Ms Lagoo won four Filmfare awards for Best Supporting Actress. 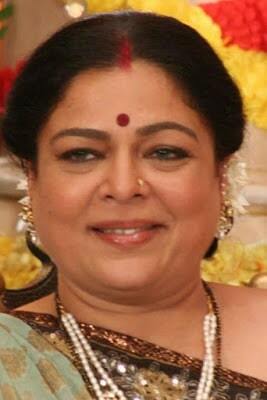 Actress Reema Lagoo died of a cardiac arrest in Mumbai at 3.30 am this morning. She was 59. Ms Lagoo had been taken to the Kokilaben Hospital. Her last rites will be held later today. Reema Lagoo was a veteran of the Marathi stage and appeared in several high profile Bollywood films, working with top stars like Salman Khan and Akshay Kumar. Reema Lagoo is survived by her daughter Mrunmayee, also an actress. Reema Lagoo was also known for starring in the TV serials Tu Tu Main Main and Shriman Shrimati. Her last screen appearance was in the Marathi film Katyar Kaljat Ghusali. 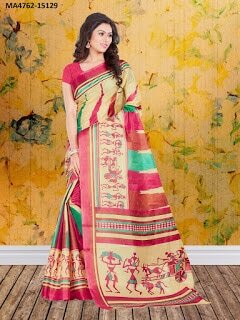 She featured as Dayavanti Mehta in Mahesh Bhatt’s television show Naamkaran. 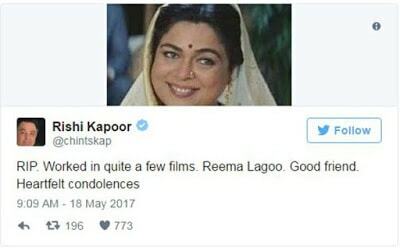 Rishi Kapoor, Reema Lagoo’s co-star of films such as Prem Granth, Henna, also tweeted about the late actress.